About half of U.S. adults have looked for a new religious congregation at some point in their lives, most commonly because they have moved. And when they search for a new house of worship, a new Pew Research Center study shows, Americans look first and foremost for a place where they like the preaching and the tone set by the congregation’s leaders. Fully 83% of Americans who have looked for a new place of worship say the quality of preaching played an important role in their choice of congregation. Nearly as many say it was important to feel welcomed by clergy and lay leaders, and about three-quarters say the style of worship services influenced their decision about which congregation to join. Location also factored prominently in many people’s choice of congregation, with seven-in-ten saying it was an important factor. Smaller numbers cite the quality of children’s programs, having friends or family in the congregation or the availability of volunteering opportunities as key to their decision. Perhaps as a result of the value they place on good sermons, church leadership and the style of worship services, many people – even in this age of technology – find there is no substitute for face-to-face interaction when seeking information about a new religious home. Fully 85% of those who have looked for a new house of worship say they attended worship services at a church they were considering, and seven-in-ten say they spoke with members of the congregation or to friends or colleagues about their decision. Looking for information online may be growing more common, especially among young people and those who have looked for a congregation recently. But online information still appears to be far less important to potential congregants than experiencing the atmosphere of the congregation firsthand. 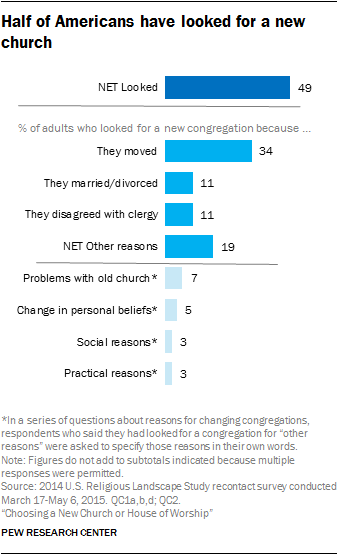 The single most common reason people give for having looked for a new congregation is that they moved: Roughly one-third of adults say they have searched for a new place of worship because they relocated. By comparison, fewer people say they sought a new congregation because of a disagreement with clergy or other members at their previous house of worship (11%) or because they got married or divorced (11%). About one-in-five adults (19%) volunteered that they have looked for a new congregation for some other reason, including other problems with a previous church, changes in their own beliefs or for social or practical reasons. These are some of the key findings from the fourth in a series of reports based on Pew Research Center’s U.S. Religious Landscape Study. The study and this report were made possible by The Pew Charitable Trusts, which received support for the project from Lilly Endowment Inc. The first report on the 2014 Landscape Study, based on a telephone survey of more than 35,000 adults, examined the changing religious composition of the U.S. public and documented the fluidity of religion in the U.S., where roughly one-third of adults now have a religious identity different from the one in which they were raised. The second report described the religious beliefs, practices and experiences of Americans, as well the social and political views of different religious groups. A third report drew on both the national telephone survey and a supplemental survey of participants in Pew Research Center’s American Trends Panel to describe how Americans live out their religion in their everyday lives. This fourth report also draws on the national telephone survey, but it relies primarily on questions asked in a follow-up (“recontact”) survey of respondents who originally participated in the national telephone poll. It explores the fluidity and dynamism in U.S. religion in more detail by documenting when, how and why Americans search for new congregations. It shows that about half of adults who have searched for a new congregation at some point in their lives considered changing denominations while they were searching. And it finds that many Americans say their own level of religious engagement has ebbed and flowed over the course of their adult lives. Meanwhile, 49% of American adults now attend religious services just a few times a year, rarely or never. A majority of them (27% of all U.S. adults) say they have never attended religious services more often than they do now. But a substantial proportion (22% of all U.S. adults) say they now go to religious services less often than they did at another point during adulthood. Quality of sermons, welcoming leaders and the style of worship services tend to be the key factors in why Americans overall choose the congregations they do, but for Catholics, nothing is more important than location. Fully three-quarters of Catholics who have looked for a new church (76%) say location was an important factor in their choice of parish, reflecting the geographically based system by which Catholics typically associate with a local church. Overall, 56% of adults who have looked for a new congregation say the quality of educational programs available for children was an important factor in their decision. Among those who currently are parents of minor children, however, about two-thirds (65%) say this. Americans who have looked for a new congregation are evenly divided between those who say they considered switching religions or denominations when they searched for a new house of worship (48%) and those who considered congregations only in the denomination with which they already identified (49%). Seven-in-ten people who have looked for a new congregation say finding one was easy, while 27% say finding a new house of worship was difficult. When asked what made it easy to find a new congregation, many of those who found the task trouble-free indicated that their new congregation was conveniently located and easy to get to (43%), that they had been invited to join by family or friends (20%), or that it was easy to find the kind of information they needed (14%). Among those who found the task of choosing a new congregation burdensome, some common explanations were that they disagreed with the theology of the congregations they encountered (26%), there was a shortage of acceptable, conveniently accessible churches in their area (24%), or they were dissatisfied with the sense of fellowship at the congregations they considered (23%). Not surprisingly, religious “nones” – people who identify as atheists, agnostics or “nothing in particular” when asked about their religion – are far less likely than those who identify with a religion to say they have ever looked for a new congregation. Still, about three-in-ten current religious “nones” (29%) indicate they have searched for a new congregation at some point in their lives. Young adults are far more likely than older people to have searched online for information about a new congregation. Indeed, 59% of adults under 30 say they have incorporated online searches when looking for a new congregation, compared with just 12% of those ages 65 and older. Still, like their elders, young people are more apt to have attended worship services at congregations they were considering and to have talked with congregation members than they are to have looked for information about congregations online. About half of Americans have never looked for a new house of worship, perhaps because they are not churchgoers or because they have been members of the same church, synagogue or mosque since childhood. Those who have never searched for a congregation are less likely than those who have looked to be religiously affiliated and to attend services with any regularity. They are also more likely to have lived in the same place all their life.